It’s central Pennsylvania in the 1950s. The average car sells for $1,750 and gasoline is 20 cents a gallon.The average house costs $14,500 and a loaf of bread is 14 cents. Milk is 82 cents a gallon and a first class postage stamp is 3 cents. The stock market is at 235. The average annual salary is $3,800 and minimum wage is 75 cents per hour. Fats Domino, Hank Williams, and Nat “King” Cole are topping the charts. The top movie is Cinderella from Disney, joined by All About Eve and John Ford’s Rio Grande featuring John Wayne. The Pennsylvania Railroad has re-equipped its passenger trains and Walter S. Franklin is its president. The railroad has three regions and 19 divisions. Steam is still in use but dieselization is well under way. 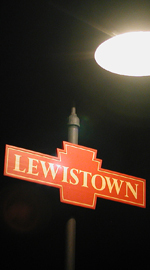 Join us at the Lewistown, on the main line between Harrisburg and Altoona. It’s fall and the extra traffic on the highways is a tip off that Penn State has a home football game. Have a seat trackside and enjoy the sights and sounds of The Standard Railroad of the World!